Little Tokyo has a lot of places that serve ramen, but the only really notable option has been Daikokuya. For me, the greatest downside is its own popularity – there is always a line outside, often very long. Enter Shin-Sen-Gumi, one of the other super-popular chains in the LA/OC area (I tend to think of Daikokuya, Santouka and Shin-Sen-Gumi) which finally opened in Little Tokyo. They opened today, in fact, thus the dozens of flower pots outside the restaurant. 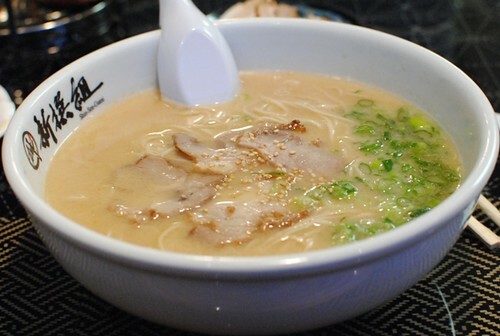 I’ve been to the Gardena and Rosemead locations of Shin-Sen-Gumi’s ramen shops, and I’ve still liked Daikokuya better. At the very least, I thought, it would bring another legitimate option and maybe help alleviate the long wait times at Daikokuya. The set-up is not unlike other locations of Shin-Sen-Gumi. The kitchen is wide open, with probably about 14 seats around a long counter. These were pretty small. Bite sized. The wrapper was a chewy al dente and I liked the filling, which achieved a nice balance between meat and cabbage. 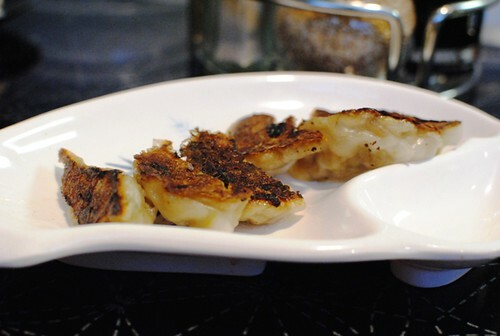 However, I thought they were too browned, to the point where the dumplings were starting to burn, leaving an unpleasant aftertaste. A solid variation of the dish. The chicken was lightly fried and kept pretty moist. 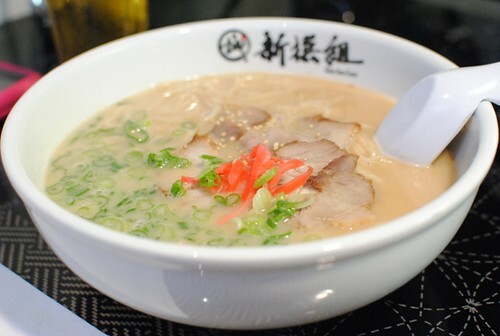 One feature about Shin-Sen-Gumi is that the ramen is customizable. There are a couple dozen different toppings, as well as choices for the doneness of the noodles, amount of oil in the soup, and strength of flavor in the soup. There are even boxes asking if pickled ginger, green onions, and sesame seeds are desired. 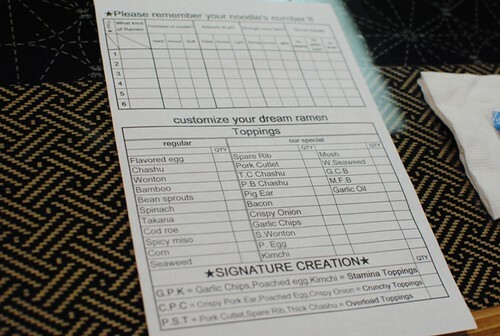 Sometimes I think it’s just too many options, but I appreciate the kitchen’s willingness to create what they call a “dream ramen” for each customer. Keeping it simple, I went with one topping (served on the side). While the Hakata Ramen comes with thin slices of chashu, this one is on a totally different level. 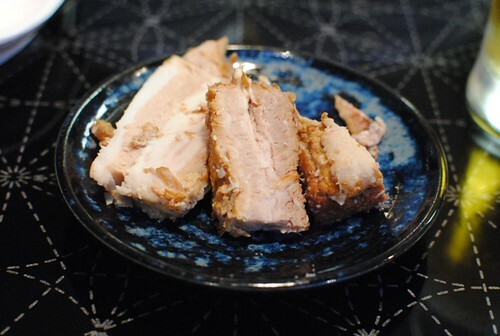 Thick chunks of pork belly are braised until almost breaking apart, and the fat seems to just melt in the soup leaving a really flavorful and tender piece of pork. Having it served cool on the side, I just wish I didn’t see all of the coagulated fat. But man, it was tasty. Ah…the featured item. In my previous visits to Shin-Sen-Gumi, I’ve struggled with the noodles. “Normal” was a little too soft for me and “hard” was just too hard. I created my own checkmarked box right in the middle of the two (“kind of hard?”) and the kitchen was happy to oblige. They came out perfectly. The broth was milky, with an expectantly deep porky, salty flavor. I’m going to have to reconsider which is my favorite bowl of ramen in the city. I finally got the noodles just the way I wanted them, making for a really good bowl. It was comforting, satisfying and full of flavor. I’ll be sure to drop by again soon and often (it is in my neighborhood, after all) to make another determination. 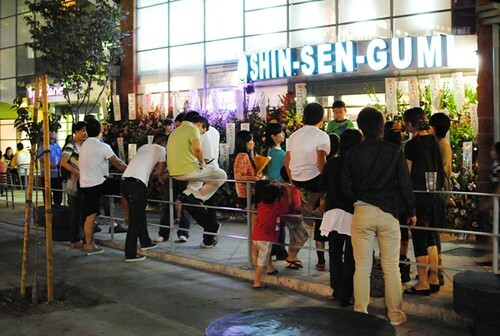 Clearly, Shin-Sen-Gumi is already a big draw (and given the popularity of the other locations, it likely will be for the indefinite future). By the time we were done eating, there were already about 20 people outside waiting for a seat. Haha yeah I’ll have to do some more comparisons, but tonight’s was very good. Nice! Customizable ramen 🙂 Loving it already. wow! another great option to little tokyo’s ramen options. i used to only go to daikokuya and also to chinmaya for my tan tan men cravings. i can’t wait to try this place. thanks for the post! Glad to be of assistance! Yes, do give SSG a shot next time. It’s nice SSG moved closer to me, so I wouldn’t need to drive all the way to Gardena for a bowl of their ramen. The one in Rosemead was a bit disappointing. Ahh too bad. Next time, we can try this one to see how it compares. SSG in Gardena is my fave bowl of ramen. Still haven’t tried Daikokuya. It’s on my list. Glad you liked it! Oh you should try it soon! HA! I love that you created your own box. Also, the color of the broth looks just perfect. 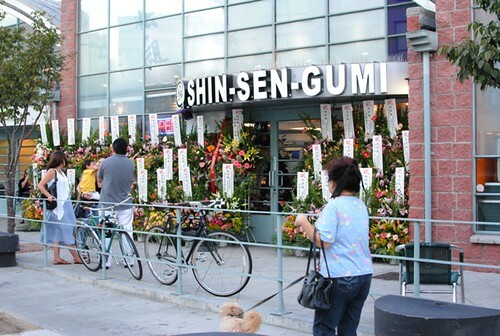 As a Japanese man with a relatives in Japan that own multiple Ramen restaurants throughout Hiroshima, I am SO pleased that Shin-Sen-Gumi is opening in Little Tokyo! Each bowl, every time will be better than Daikokuya’s. This is a fact in which it is NOT debatable. Given, a bowl under the large yellow awning is never BAD, they’ve got the idea of a good bowl of ramen pretty much down, but IF Japanese food is about ANYTHING it’s about the details, which Daikokuya EXTREMELY lacks (perhaps and understandably due to their volume). BUT…(darrin this is for you) next time you make a trek to Little Tokyo, try out both noodles and compare. 3 things you’ll find EVERY time. 1: The green onions found at Daikokuya aren’t washed, they’re cut without care, too large and still stuck together causing the onions not to blend with the bowl but only annoyingly stands out with it’s harshness. 2: The egg is always over-boiled and cold and brings down the temperature of the bowl (less heat? less flavor). There’s is something inherently EVIL about working on a hot bowl of noodles (OR ANY HOT FOOD for that matter) and then biting into a cold ingredient that isn’t supposed to be! 3. The noodles are just plain terrible. Pretty much the same thing they use at a place like kabuki. Factory made, dehydrated, then livened back up in a boiler. Those things put together…STILL A GOOD BOWL (the soup…AMAZING) but these crimes against the ramen Gods are ALMOST unforgivable! 3 things you will NOT find at SSG (evidence: Chashu with green onions small plate at SSG, look at those beautiful cuts of onions! it’s an art!!!). Thanks for the input Arthur. I’ll be honest, my personal preference probably doesn’t always align with a traditional, authentic bowl. But I can see what you’re talking about with the consistency and attention to detail. Finally decent ramen in Little Tokyo, I hate that fact that most people love Daikokuya and consistently force the lines to go for 1.5 hours. Seriously there are way better ramen joints in SoCal but Daikokuya only does well because of the location. A few years ago it was still decent but they have expanded too fast and far and the quality has slipped among all locations. At SSG I still feel like they care about the food because I can see it and appreciate the finer details as well. 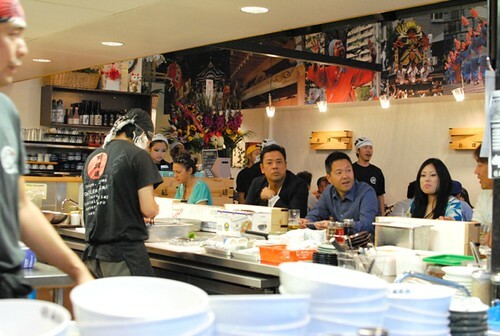 I’ve eaten at many ramen places around SoCal and IMO among the key players Daikokuya has fallen hard and fast with newcomers with Ramen Yamadaya, Fujin Ramen, and looks like Nidaime Tsujita is getting serious. 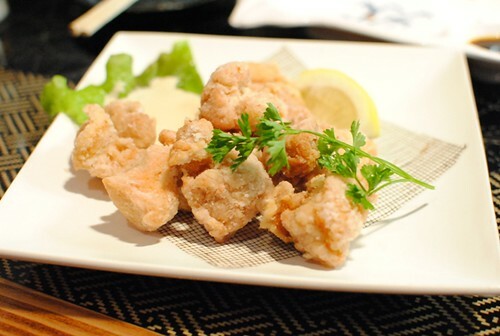 Also finally glad they added chicken karaage to the menu, something every other ramen place has but SSG has been slow to catch on. I haven’t been able to try Ramen Yamadaya, Fujin Ramen, or Nidaime Tsujita (far) yet, but it’s on my list…particularly the first. Agree that it’s great we’re gettiing more competition in this space here in LA.